In our Gospel today, we have before us an early form of an opinion poll. Our Lord asks His disciples, "Who do the crowds say that I am?" In reply, they say something to the effect, "33 percent say John the Baptist; 33 percent Elijah; and 33 percent one of the prophets." Of course, it is Peter who confesses his faith that Jesus is the "Christ of God" - meaning, the anointed One. Unlike public figures of our day, the results of this poll don't deter Christ from fulfilling His mission. He neither changes his approach nor revamps His plan for saving the world through the Cross at Calvary, just because there seems to be confusion among the Jews as to who Jesus really is. There were different opinions out there as to who Jesus was - some saw him as a political or potential military leader or a celebrity of some type. Even in our own day, we see individuals make Jesus fit into their personal definitions of who Jesus should be. Rather than accepting Christ for who He really is, people try to categorize him into a religious teacher or political revolutionary or prophet or philosophical guru or whomever they want Jesus to be. In the end, it was not the crowd and their ideas who defined Jesus. Rather, the truth about Jesus came from God who reveals to Peter the truth of Christ's identity. Peter speaks for the Apostles and the Church that would be founded on this faith. Hence, the truth about our Lord and every truth about the faith comes from Peter and his successors in the Church. This is how we know who Jesus is. It is interesting to note that our Lord, after having received Peter's confession of faith, does not say, "Good, Peter - now get the word out there and let everyone know what you know so that when I am taken up to Jerusalem, I will be made king." Instead, Jesus does quite the opposite. First, he instructs the disciples not to tell anyone what Peter has said and second, that discipleship will not mean glory in the earthly sense. Rather, it will mean suffering, self-denial and losing one's life in order to save it. Thus, our Lord encourages his disciples to exercise self-less service and true love - consideration for each other out of love for God. Is this not exactly what God expects out of parents? In fact, parents know quite well that the one who practices self-less love for another - will suffer and be rejected, as children often do to their parents at least once in their lives. In particular, our society honors one particular class of parents this weekend - our fathers. It may be worth holding up for our consideration qualities against which we can measure ourselves with that epitome of fatherhood, St. Joseph, the foster father of Jesus. Note that for St. Joseph, fatherhood was not a biological fact - fatherhood in God our Father and for St. Joseph and for priests means a spiritual bond, a kinship, a relationship to our blessed Lord. In his own life, St. Joseph insisted on staying in the background, avoiding the spotlight and quickly and uncomplainingly doing the will of God and accepting whatever hardships came along. He was always content to let the spotlight fall on his wife and son rather than himself. And yet, Joseph never lost his place as the head of the household. When Mary and Joseph find Jesus in the Temple when Christ is 12, Mary is deferential to his authority by admonishing Jesus after He has been lost - "your father and I have sought you" - rather than have Joseph use his authority as the family head. Joseph also trusted in God to provide the means necessary to accomplish what God asked of him - to leave home and workshop and go to Egypt where he probably did not know anyone in the Jewish community and had to start his business from scratch. When the Holy Family left in haste, Joseph did not calculate for the future - there's a reckless abandonment to divine providence - that God would provide for the family's needs. 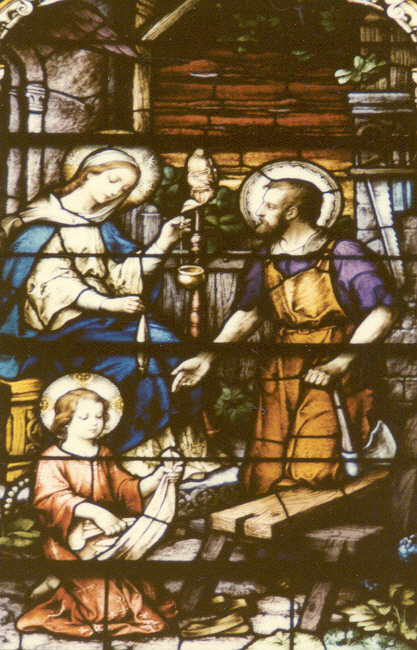 St. Joseph was a worker and is the patron of workers - he was what would today be termed a skilled craftsman. An undoubtedly devout Jewish father, he taught his adopted son a trade (why the Scripture refer to Jesus as "the carpenter's son"). St. Joseph would also have been responsible for the religious training of Jesus and would have taken Jesus with him to the Temple to worship with the rest of the men. St. Joseph also helped form the Sacred Heart of Jesus. In cooperation with the Immaculate Heart of Mary, St. Joseph helped form the human heart of our Lord. He was not an emotionally-distant husband or father - he knew the value of a total integration of one's emotions so that Christ looked to St. Joseph as to what it meant to truly be masculine. If we marvel at our Lord's heroism in His Passion, we have St. Joseph to thank for forming that humanity. Thus, St. Joseph epitomizes the qualities we pray that all fathers would have - a selfless dedication to providing for the needs (not just the wants) of their families; fulfilling their role as head of the household and accepting the accompanying responsibility for sustaining and training their children in the Faith; fully loving their wives and appreciating them; and sacrificing their own time and desires for the good of the family. St. Joseph is also the patron of a happy death and since tradition holds that St. Joseph died with Jesus and Mary at his side - He is the icon of the spiritual and physical comfort and support we all hope we will have at our death. St. Joseph shows us that it is in dying to self that we live forever and that denying ourselves and taking up our Cross daily is the surest way to heaven and a condition for discipleship. All good fatherhood is a participation in the Fatherhood of God the Father - our most merciful and just Father whom we address with such intimacy in the Lord's Prayer. I'll close with a story that encapsulates how God the Father loves each of us - His beloved children: There was a priest in the Archdiocese of Denver who was reminiscing about his childhood and his relationship with his father. Of all the wonderful memories he had about growing up in a middle-class, blue collar family in Denver, one memory would always stand out. When this future priest was 18 years old and just finishing high school, he asked his father if he could go out with his buddies one Friday night to hang out. His father agreed but warned him that the curfew rule still applied - in by midnight, was the rule. The young man agreed. Unfortunately, the young man did not uphold his end of the bargain - he stayed out until 6 in the morning. As he was walking up the driveway to his home just past 6 a.m., his father was heading out the door to work, since he worked on Saturdays to make ends meet. His father was furious but all he said was, "You're grounded - bread and water for dinner for the next 5 days!" Later in the afternoon, the father returned from a long day of work and the family gathered around the table for supper, said the blessing and began to eat. Each of this future priest's siblings and his mother and father had heaping plates of food placed in front of them while the young man got what he expected - bread and water. But before he could start on his meager meal, he noticed his father at the other end of the table, get up, take his own plate of hot food and place it in front of his son to eat. Meanwhile, the father took his son's bread and water and began to eat it himself. The son was shocked. he asked, "Why did you do that?" The father replied, "Because that's how God the Father loves you, even when you disobey Him." Suffice it to say that this future priest never forgot the meaning of God the Father's love for each of us and just exactly how much He loves us - so much so, that he gave up his only Son to die for our sins. It is my prayer that each of the fathers here present will aspire to live up to the great challenge that our heavenly Father issues to each of us by His omnipresence, His selflessness, His humility and His paternal care. We pray, too, on this day, for all of our deceased fathers - may they rest in peace. May each of us live our lives in a way that befits the legacy of faith that our fathers have left us to enjoy and one day, may we all see the most lovable face of our heavenly Father in eternal glory.